Maine is the biggest seaweed harvester in America, and seaweed has become big business. More than 20 companies in Maine cultivate or harvest seaweed for its wealth of uses, with health included. In 2014, Maine harvested 17.7 million pounds of seaweed, which is a record for the state, according to reports. Seaweed is so hot in Maine that the state even holds an annual seaweed festival, which drew more than 3,000 people last month. “Maine is excited about seaweed, and the world is excited about seaweed,” Hillary Krapf, the founder of the Maine Seaweed Festival told NBC News. “More people are interested in sea vegetables, and a lot more Americans are a lot more savvy about eating nutritious foods,” Susan Brawley, a University of Maine botanist, told NBC News. Seaweed is trending in America, but the U.S. is still decades behind the seaweed industries of Japan, China, and South Korea. The seaweed industry in Asia produces 25 million tons per year, according to reports. Despite Asia’s large-scale dominance in seaweed harvesting, small businesses in Maine continue to pop up and supply this new handcrafted food to the American market. Maine Coast Sea Vegetables, founded by Shep and Linnette Erhart, has been in the seaweed business since 1971, according to their company website. Seaweed products on the market come in many shapes and sizes, as well as different textures. Rockweed is the most commonly harvested seaweed in Maine; it is utilized in animal feed, purchased by food manufacturers, and is also used as a fertilizer. Sugar kelp is another variety of seaweed; it makes a wonderful pasta alternative. And some may be surprised that Irish moss seaweed is used in the beer brewing process. The Maine seaweed industry’s worth is estimated at approximately 20 million dollars, according to a 2015 “Maine Algae Cluster Market Research” report performed by Gardner Pinfold Consultants Inc. However, seaweed is not just a moneymaker. 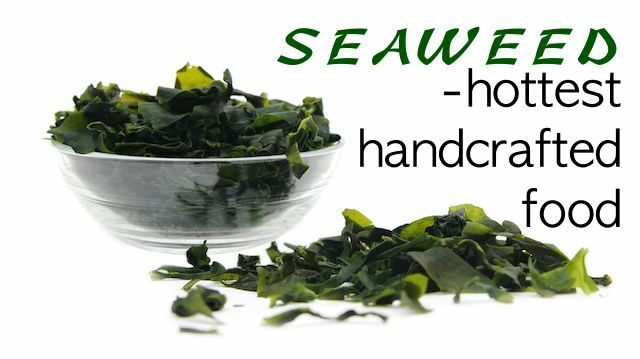 Seaweed boasts a number of health benefits, including better digestive function, improved immune function, reduced blood pressure, improved circulation, enhanced thyroid function, and better bone health. Seaweed is also rich in vital vitamins and minerals, like calcium, iron, magnesium and vitamin C. What’s not to love about seaweed! Except, of course, when it slithers across your ankle as you wade into the ocean, inducing a Jaws flashback and a fit of hysterics! How do you eat your seaweed, and why? Next articleIs Lack of Sleep or Lack of Minerals Making You Tired? Hey Buddy!, I found this information for you: "Seaweed Is the Hottest Handcrafted Food, with Maine Leading the Market". Here is the website link: https://www.thealternativedaily.com/seaweed-market-maine/. Thank you.